The end of the nine based cycle of black magic, materialism and primitive pseudo-science based upon materialism, has been replaced by the ten cycle brought in by the force of the tenth planet Sedna. Now all the occult is obsolete as is materialistic science of the Matrix. The Sedna PC carries the force of the tenth planet/cycle into the Matrix to focus like a laser the Force. This Sedna, ten cycle force changes all that has been before. 1. All occult being based on the nine cycle of the Matrix is destroyed by focussing the Sedna ten cycle PC on it. All intelligences, spirits, demons, powers, angels are erased by holding the Sedna PC in your left hand, as are all occult rituals, powers and the Matrix. Holding the Sedna PC in your right hand remanifests the Ingelligence as a ten cycle Dark Science Power. Tim Rifat has rendered all occult practice null and void. The new Dark Science takes over now the Kali Yuga has been replaced by the Dark Yuga – Age of Dark Science. As all occult rituals are now useless, all occultists should purchase the Dark Science Neophyte Course, in which Paul Hughes-Barlow explains how to apply the occult in the Dark Yuga brought about by the destruction of Yaldabaoth, the demiurge creator of the Matrix. Since dark matter appears blue when RV we both prefer to call the new cycle the Blue Yuga. 3. Use the right digits to project planetary powers. As all occultists will know each planet has specific powers. Paul’s Dark Science Occult Neophyte Course describes all of these ten cycle planetary powers and how to use them. In the 10 cycle the 5 frequency is important the Jupiter planet is the largest in our solar system and Sedna the most torsionic. This 5 step progression is very important as it is based on the 5 extraordinary sets of mathematics, the basis of ten dimensional M Theory. The combining of the first 5 planetary forces with the next 5 planetary forces, provides the solitonic torsion fields needed for all the major occult rituals of ten cycle dark science. Adam Kadmon, the image of Yaldabaoth is now psychotronic fuel to be used by the dark science occultist, these Blue Yuga occultists can transform themselves into Blue Angels, linking with their Holy Guardian Angel by means of the above techniques. Since Adam Kadmon and Yaldabaoth are now psychotronic fuel, and the mouth ingests food/fuel, combining the five hegelian dialectics of planetary forces in parts of the mouth is used to input 10 cycle energy into raising the occultist to Blue angel status. The Dark Science Neophyte Course initiates the occultist on this new cycle magick. 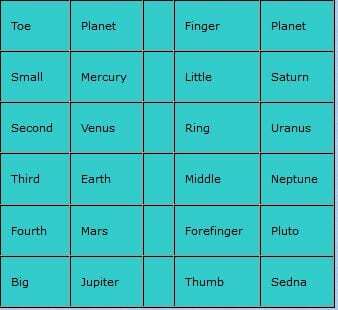 To activate each planetary power in your mind’s eye link the Sedna PC to the digit of that power, imagine the Sedna PC merging with your middle finger of the left hand to draw into you and your life the power of Neptune. All phenomena, the occult, life, new age developments, etc., have been designed by Yaldabaoth to syphon our life force in return for power, money, psychic experiences, etc. The nine cycle Matrix has been a giant life force extractor for the demiurge, archons, etc.. With the Sedna ten cycle the Matrix has been shattered for the few Psi-masters who wish to draw life force from the Matrix to boost their own demigod-like powers. Ancient Egypt’s most important funerary ritual was called “the Opening of the Mouth” as was that of ancient Mexico where it was called p’achi. Paul Hughes-Barlow, the new Ipsissimus of the age has developed the rituals of the mouth described in 3). The Egyptians used The Opening of the Mouth on the deceased which sustained the ka in the corpse, this ka is the bioplasmic body which gets caught in the archon aeons of heaven and hell. The ritual enables the ka to eat breath, see, hear and enjoy the offerings and provisions performed by the priests and officiants. This ka is the astral body perceived in dreams and is the awareness you inhabit after death. The Opening of the Mouth Ritual enables the ka to be used by the psi-occultist, the most important step needed to transform a neophyte into an adept. The Sedna PC enables the neophyte to use the ten planetary forces to open up the 5 gateways in the mouth, M-ways of Psi-space so the ka becomes a ten cycle being not a nine cycle archon food-source. To this end the Sedna PC should be used with Paul’s Dark Science Neophyte Course to free the ka for occult work. 4. The Egyptians believed the hearts of the damned were swallowed in the underworld by a horrible monster named “Eater of the Dead”. In ancient Mexico, one level of the underworld was called Teacoyolcualloya “place where beasts devour hearts”. The Sedna PC enables the Psi-adept to avoid the double death where your ka is stripped of its heart trapping you in archon reincarnations – very unpleasant. By using the Sedna PC you automatically pull yourself out of the nine cycle into the ten cycle of Dark Science – where new rules apply. PHB has worked out the occult significance of the heart, numerology, historical significance and offers insight in his Neophyte course. a. Using the south face the dark energy/matter to control the ten cycle Matrix. b. Using the north face to access the dark energy/matter to control other dimensions or bring in to this 10 cycle Matrix other dimensional dark energy/matter fro control. c. The east face to access other time-lines to get dark energy/matter to use other time-lines or to control this one. d. The west to control time by entering the “Wheel of Time” to use dark energy/matter to manipulate time to control the 10 cycle Matrix. e. The bottom face is used to access the lords of the dead to use necromancy dark energy/matter for control of the 10 cycle Matrix. The shadow pyramid under the top pyramid, this enables the Psi-adept to access the alternate megaverse on the other side of the torsionic soliton of 5D space, the twin to our own megaverse. This gives us acess to non archon, Yaldabaoth space, as we live in the shadow chaos side of the torsionic soliton, as the other side are universes where awareness destroyed Yaldabaoth by evolution of consciousness, true humans, etc, who have 11 cycle Matrix technology. Use the Shadow Pyramid to access those 11 cycle Matrices as above. The bottom face is useful as it shows you a realm of the dead where the ba-ka, bioinformational and bioplasmic souls have been merged to enable 11 cycle Matrix awareness to enjoy life after death. As a 10 cycle Matrix awareness you can learn to emulate this soul merging to make life after death you own choice not that of archonic 9 cycle heaven/hell. By this means you can learn to reincarnate to achieve Buddahood the highest form of consciousness allowed by cosmic law for 10 cycle Matrix awareness. The lower pyramid is very useful as 11 cycle Matrices give you all the technology to fight 9 cycle Matrix archons, demons, etc, that infest this Megaverse. Tim Rifat’s Psi-master Course contains more information on the use of the Sedna PC.